Drama. Analyse this. 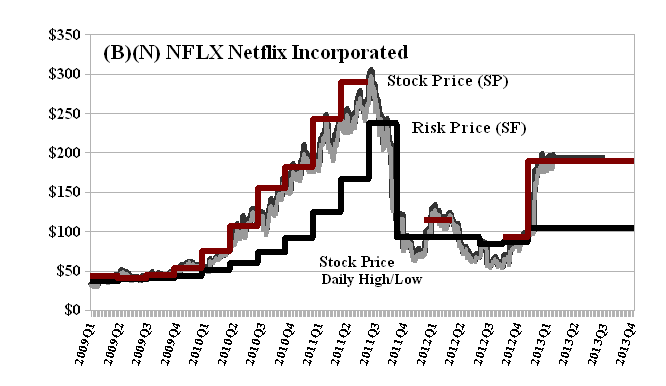 We looked at Netflix in January (please see our Post and Exhibit 1 below) just as it was breaking the Risk Price (SF) at $104 which is likely to rise to $150 by year-end if investors keep “liking” it that much – and of that, we’re not so sure, but we can still explore our options as risk averse investors (please see below). Our February call at $145 is long gone (on January 24 at $147) and the company is trading today at $189 which is more than twice the December close of $93. A lot of investors feel that they got unduly burned in the run up to, and then, the price collapse from $298 in July 2011 to $60 a year later in October 2012 (just five months ago) and, forsaking the principle of caveat emptor, there are a number of lawsuits regarding the company’s alleged failure to deliver on its subscriber base (for example, March 13, 2013, Cohen Milstein Sellers & Toll PLLC Announces the Investigation of Netflix, Inc.) and a new complaint on an alleged “breach of fiduciary duty” (March 6, 2013, Netflix Shareholder Alert: Briscoe Law and Powers Taylor Investigate Possible Breaches of Fiduciary Duty by Officers and Directors). And we have our own “confusion” about an apparent change in its Amortization & Depreciation Expense which was nil in the last quarter of 2012, but $400 million in every other quarter (please see the Annual Report, Form 10-K, December 31, 2012). The “fundamentals” are that the company currently has a market value of $10 billion, total assets of $4 billion, and a shareholders equity of $785 million, and has never paid a dividend with operating revenue on sales of about $4 billion coming in at less than $100 million (except for the apparent boost of $400 million in the last quarter of 2012). It doesn’t make any sense for us to own this stock as an investment – we want our capital to be safe and obtain a hopeful return above the rate of inflation, without blowing our wheels off, so to speak – but the May put at $185 is going for $14.55 per share today and the cost of that can be partially offset by a sold or short call at $200 for $13.15, so that for $185 to $189 per share for the stock (if we can get it at that price – our estimate of the downside volatility is minus ($35)) and a “collar” to protect our price between $185 and $200 for $1.40 per share ($14.55 less $13.15), we could stick around and see the end of the show. Other companies seem to have to work a lot harder for their stock price, most of the time, but it’s possible to discount and work “greed” when it seems to pervade the market.